One of my objectives this year is to build a decent bug out bag (BOB). To that end, each month I am focusing on one specific area of need for the BOB. January was the month I focused on water – hence my previous posts about emergency water purification and the Sawyer mini. Culminating my research for the month of water I have put together a decent gear load out to assist with sustaining hydration. I determined that the ability to carry about three (3) liters of water per person was a good starting point. While there are many ways to accomplish this, I ended up with two major options centered around two hard bottles and one collapsible bottle. The next set of requirements were based on the amount of time one might have to stop and resupply. The more time one has, the less consumable water purification resources may be used. Additionally, one can mix and match these capabilities based on the available resources and the situation, such as using the gravity filter supplemented by boiling at the same time. 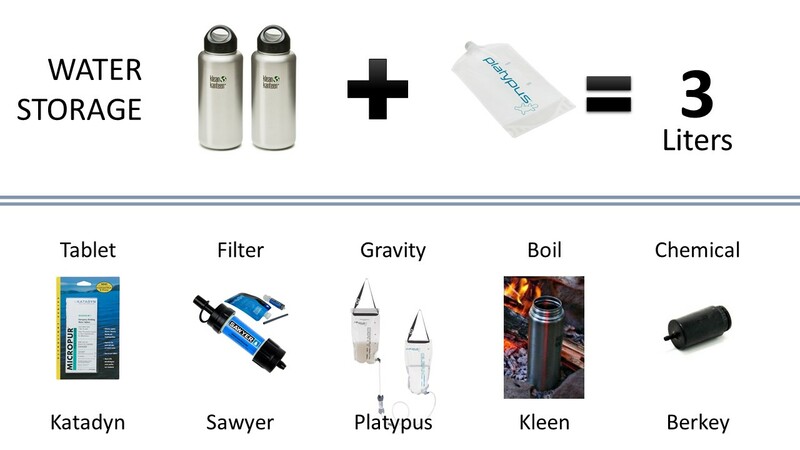 Operational Recovery purification: Boil in Klean Kanteen as noted by Einar A. As I mentioned in the previous emergency water supply post, these options address most of the issues one would face with water on the go, but not chemicals in the water. To have some level level ability to address some heavy metals and other contaminants I have added a Berkey filter that I can place in my canteens post filtering or purifying with the other methods. It may not have a large chemical filtration capability, but I see it as better than having nothing.